Right so I went to Cornwall for the weekend and ate exactly what I wanted. Amazingly I stayed the same at Weigh In this week! Can't believe my luck! Quite clearly eating pies and chips works for me! So this week I need to get back on track and lose lots! I've got a 10 mile walk this weekend which should help with the loss! I'd like to point out its for charity! I'd never ever agree to walk that far without some sort of charity being involved! Oh and the trampoline idea is on hold for now.... due to work I'm not sure about spending large sums of money! I want a trampoline. Actually, 'I want' makes me sound like a spoilt child so I'll rephrase. I would like a trampoline. Not one of the mini ones though, a big'un! The only thing is I'll have to convince my mother that it's worth it... I've not actually asked her yet. I did briefly consider just buying one and then bringing it home. 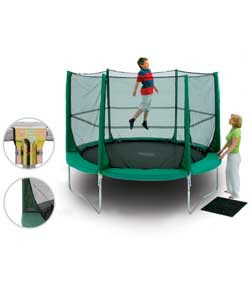 Would a caring mother be able to tell her sweet little girl that she has to return her brand new shiny trampoline? Could she really look into my eyes and hurt me like that? Well I'm not sure. But to be honest, it's not just for fun that I want the trampoline. It's great exercise right?? They run classes in trampolining (if thats the correct term!) at the local leisure centre! If there's a class in it then it must be good exercise! Well I have the most supportive friends at work. Apparently I gotta be realistic in my thinking...... which according to them means not getting my hopes up about looking like Jessica Alba..... think they're a bit mean actually! I can dream! If Martin Luther King had woken up and thought 'well I have a dream but I don't think it's realistic' where would we be now?? Not that I'm putting myself on the same level as him obviously! But you can see where I'm coming from right? I was thinking earlier, how much would I pay to look like this??? Cos I reckon I'd give away one of my kidneys and take the consequences if it meant looking like this! Is that going too far? Well this is my 'thinspiration' and I'm going to get there one day if it kills me! Anyway.... just a thought! I wanna look like this! How often am I allowed to 'blog'?? Is there a limit?? I've had about 10 people already say to me that they've read the blog so I guess I should make it more interesting! Well I stuck to my points yesterday, woohoo!!!! But tonight I have to go out with a mate so there will be drinking involved. I'm hoping that if I dance enough it'll work off the calories from the alcohol.... although that may be too much to hope for! So during the day today I'm gonna be mega mega good! Sushi for lunch (yum! 3.5 points!) Hope everyone has a great day! Right, not 100% sure why I'm doing this but people I know keep asking me how I'm doing with this diet stuff and I figured this would be an easy way of keeping people up to date without repeating myself hundreds of times! My name's Dani. I'm 21. I've been doing Weight Watchers since January 6th 2009 and have, to date, lost 4 stone. I am 20lbs away from goal which I'm very very excited about!!! There's a thin girl inside me fighting to get out! So I've joined Weight Watchers and was doing really well until a few weeks ago, once I hit 4 stone as a loss I felt so happy that I've let it slip a bit! So I thought maybe doing this blog would motivate me to get back on track. I'd love people to follow me! And if at any time it looks as though I'm heading towards the sweets please please try to stop me! I've worked so hard and want to keep it going! Hey, I'm Dani. I'm 21 and wanna look in the mirror and smile! That's pretty much it!